The thing is, your abuser is convinced that he was perfectly justified in abusing you. He did it because you made him do it. You made him mad, so he was completely entitled to punish you accordingly. He doesn’t see himself as an abuser at all. See, it’s completely different: he’s not like those other guys who abuse women for no reason. He had a reason, so it was okay. It doesn’t matter that your unforgivable infraction was simply asking him to spend some time together, or asking him to not chase after other women, or looking unhappy because he always wanted you to hang out with the girl he’s sleeping with behind your back, or simply trying to defend yourself while he screamed in your face. You get lost in addressing the specific issues at hand – and, anyway, the only acceptable resolution is that you have to shut up about it – but what you’re missing is that it’s not about those issues at all. The point is that you are disobeying him. That you are expecting to be treated with some respect, like a person, instead of a doormat or his personal punching bag. You are trying to break free from his control, and your abuser can’t allow that. You have to shut up and take it. You brought it on yourself anyway by displeasing him in the first place. No resistance will be tolerated. No rebellion. It is his God-given right to control you and crush you as he pleases, and you have no right to stand up for yourself, or even to be unhappy about it. You’re a disobedient child to be beaten into submission by a domineering father; you’re a fussy dog to be kicked by a cruel owner until all you do is cower whimpering with your tail between your legs; you’re a TV that doesn’t work properly and gets smashed with a baseball bat by an angry drunk. You’re not doing what he wants, and the insane fury this brings on is terrifying. In that moment, he seems capable of anything. 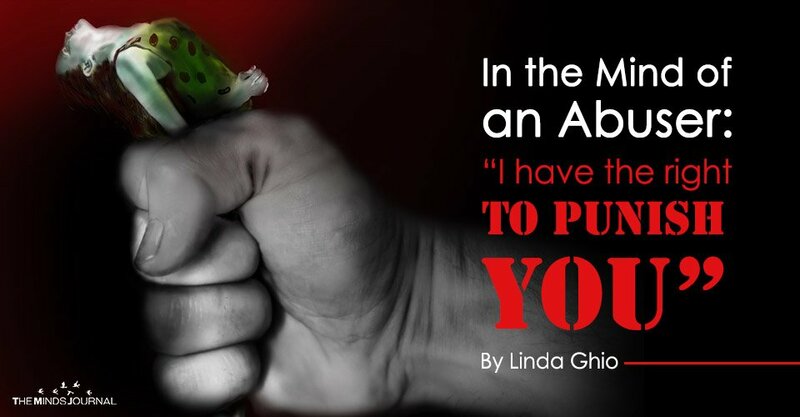 You always found it impossible to imagine how a partner, a husband, could ever savagely beat his girlfriend or wife. In that moment – that one surreal, unbelievable, blood-chilling moment – you understand. You keep telling yourself he would never, but you have seen clearly that he could. And, deep down, you know that next time, he just might. And what’s more terrifying, when you think about it later, is the chilling realization that he feels completely entitled to that reaction. The first time you try to defend yourself is also the last. You’re too scared to ever try again because you saw that, in that moment, he hated you. That screaming monster, his muscles bulging, his face contorted in rage, completely, utterly hated you, and the only goal in his mind was to destroy you, to break your resistance, and put you back in your place. There’s a stage toddlers can hit where they feel entitled to anything they want, and to everyone doing exactly what they want the instant they want it – and, if it doesn’t happen, they throw a temper tantrum because it’s not fair. They kick and scream and they hate you, you’re evil and they hate you, and in that moment they don’t seem to remember that you’re a kind parent, and that they ever had any love for you at all. It can be an annoyance or, in hindsight, even amusing. The consensus among experts is that abusers never emotionally matured past that stage. Except that they are adults, smart and strong and violent like adults, and their temper tantrums, their revenge, are far from amusing. They’re terrifying. And can be very, very dangerous. I saw my abuser be completely outraged any time something didn’t go the way he wanted. Be absolutely furious anytime someone refused to do what he wanted. It was an injustice, an insult which couldn’t be tolerated and had to be punished at once. It was something he was entitled to that was being denied to him, which was unacceptable.